Happy Independence Day! It commemorates (for my non-US readers) the day — July 4, 1776 — that the American colonies claimed their independence from England. 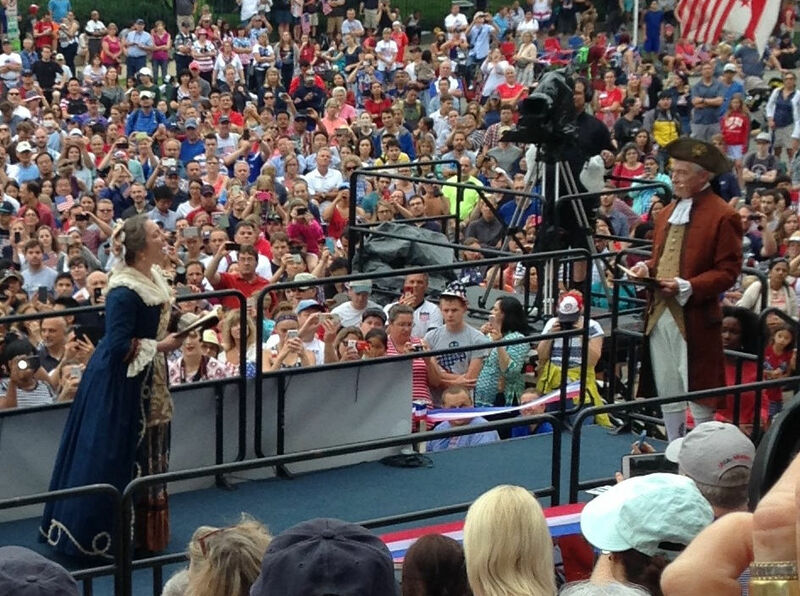 Each year, the US National Archives — which is the keeper of the original Declaration of Independence — holds an Independence Day celebration, the highlight of which is the reading of the Declaration by reenactors portraying various early Americans. And each year, I tell myself — as I do with so many events — that I’m going to attend. Since this could be my last ever 4th of July in DC (you’ll hear more about that at the end of this post), I made an extra effort to get there. 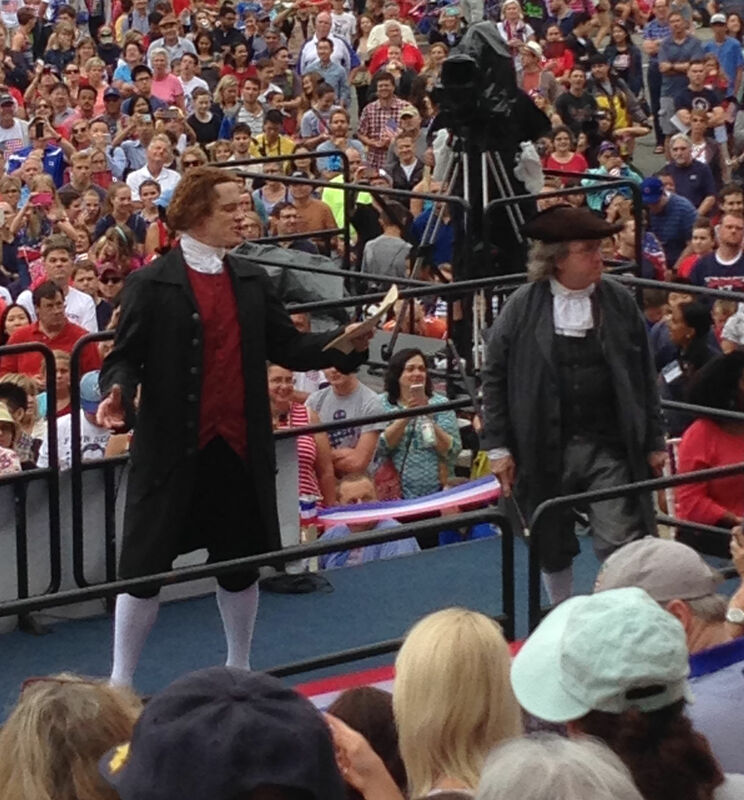 There was music starting at 9 and the Declaration reading starting at 10. I took an empty subway train to the Archives subway stop (it doesn’t get any more convenient than that). The Archives building is directly across the street. There was seating on the wide, sweeping stone steps that lead up to the front door of the Archives. At 8:30, it was already about half full but I got the perfect place: toward the center of the very top row of the peasant area (the stairs were roped off at a certain point, and only those who donate $1000 or more a year to the Archives Foundation — i.e. not me — were allowed above it). The other nice thing about sitting on the stairs: while a vast crowd eventually accumulated in the street, the stairs never got crowded. I sat next to a solitary older woman who turned out to be a tourist from southwestern England (just next to Wales! she said) and we owned that top row. At 9:00 exactly, a band called the Brass Connection started things off with a jazzy version of Bill Withers’ Lean on Me. I love that New Orleans jazzy brass sound and Lean on Me is one of my favorite songs so: squeee! They played for about 30 minutes, then the US Army Old Guard Fife and Drum Corps came on. 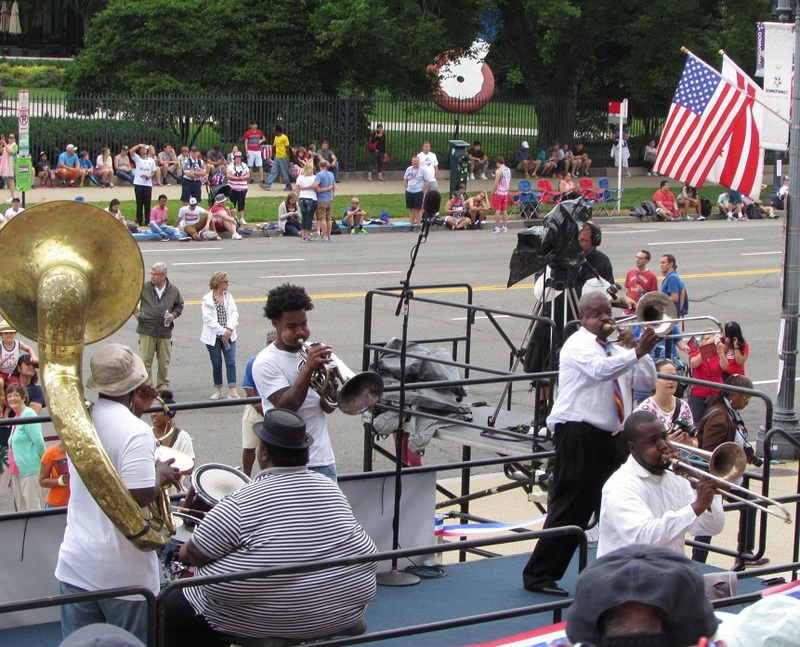 The musicians in this unit are all active duty military and playing music is their full-time job. 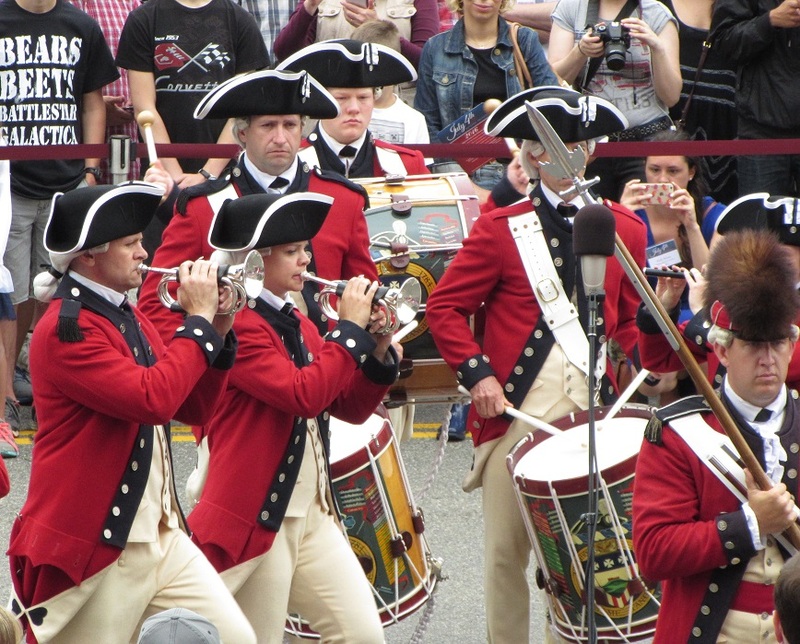 Their uniforms are patterned on those that had been worn by musicians attached to George Washington when he was commander of the Continental Army. I’m a fife and drum groupie so squeee! again. After the Old Guard came the MC, a news anchor from the local Fox station, to do all the introductions. Since I don’t watch Fox, I had no idea who she was and she seemed a bit superfluous. Then came the Archivist of the United States, to give a welcome speech. Did you know we had a national archivist? Well, we do. After a few paragraphs, Abigail and Johns Adams picked it up. Thomas Jefferson, John Hancock and Benjamin Franklin took over once they got to the grievances against George III. 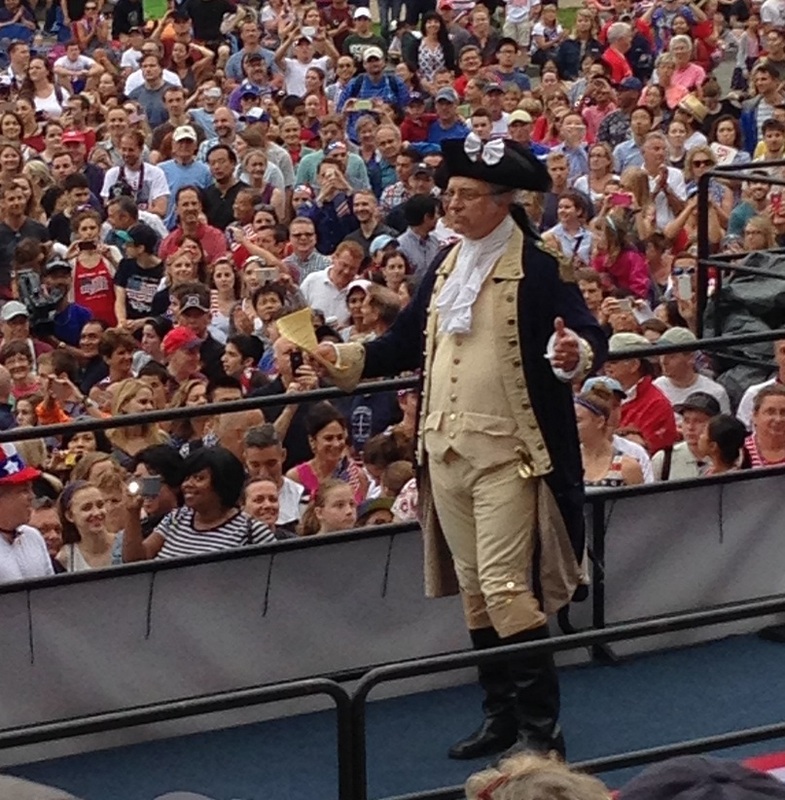 It was during this segment that we were encourage to huzzah for the patriots and boo the perfidy of King George. There were signs, held aloft, in case we didn’t know which we were supposed to be doing. Even the Englishwoman next to me booed heartily. He has refused his Assent to Laws, the most wholesome and necessary for the public good. Booo. He has forbidden his Governors to pass laws of immediate and pressing importance, unless suspended in their operation till his assent should be obtained; and when so suspended, he has utterly neglected to attend to them. Hey, I’ve had bosses like that. In any case: Booo. 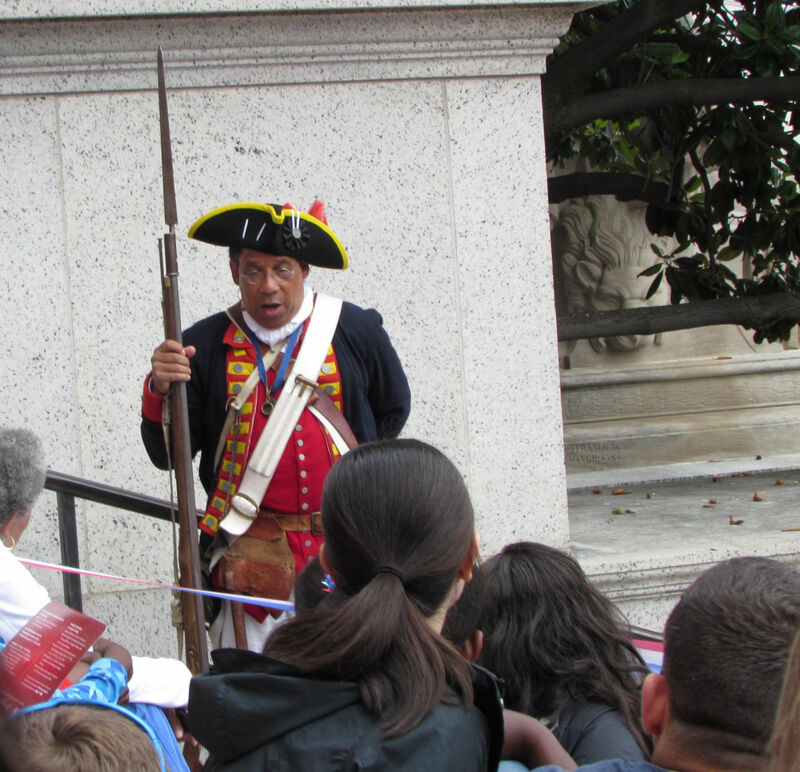 The final segment involved Revolutionary War hero and free African American Ned Hector. Hector was a wagoneer in a Pennsylvania artillery regiment. When the Continentals were losing the Battle of Brandywine and the soldiers were told to abandon guns, wagons and horses and save themselves, Hector was reported to have said, “The enemy shall not have my team; I shall save my horses and myself.” And he did. 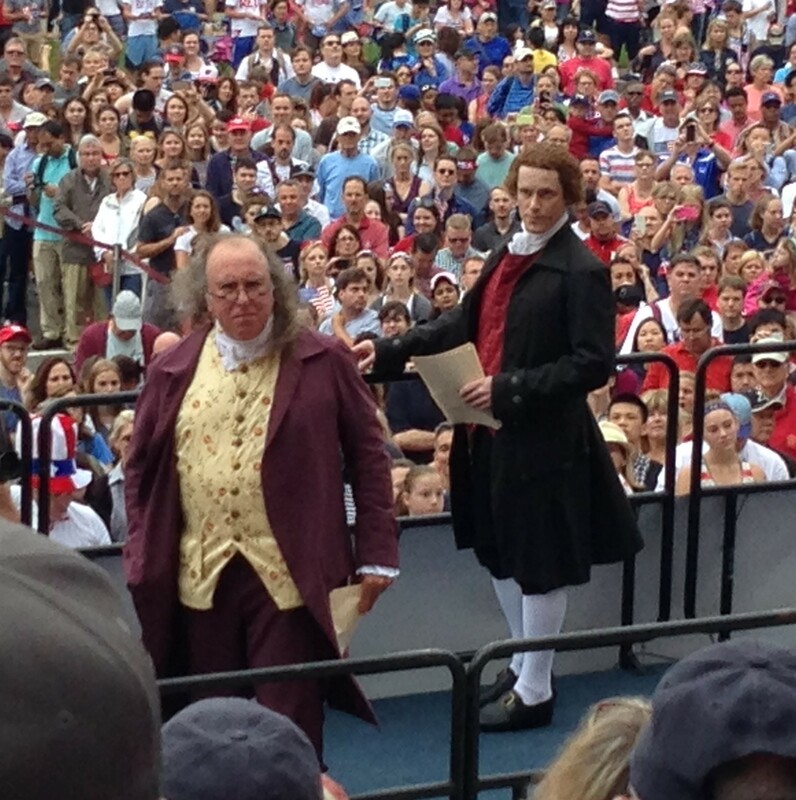 Private Hector read out the names of all of the signers of the Declaration. Which means that he got to say Button Gwinnett. 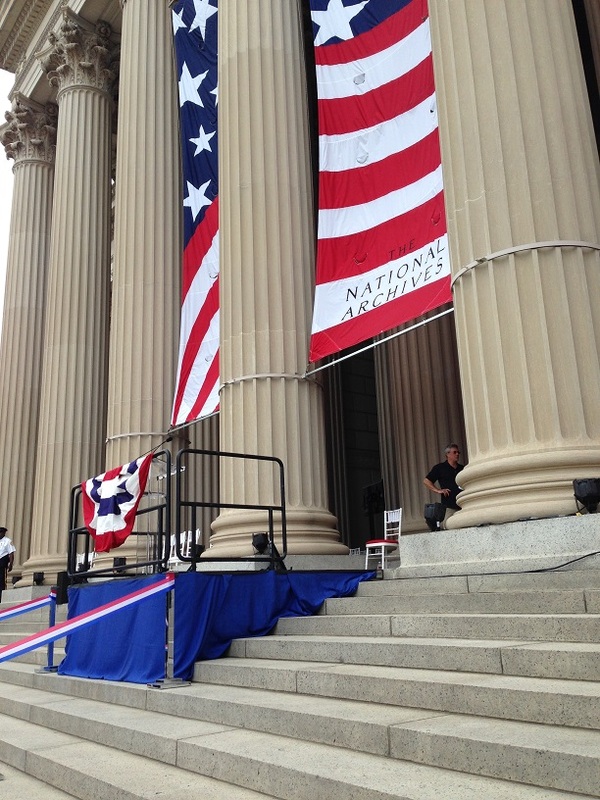 At the end of the program, the public was invited into the Archives to see the Declaration of Independence and the Constitution. With a few hundred thousand of my best friends? No thank you. 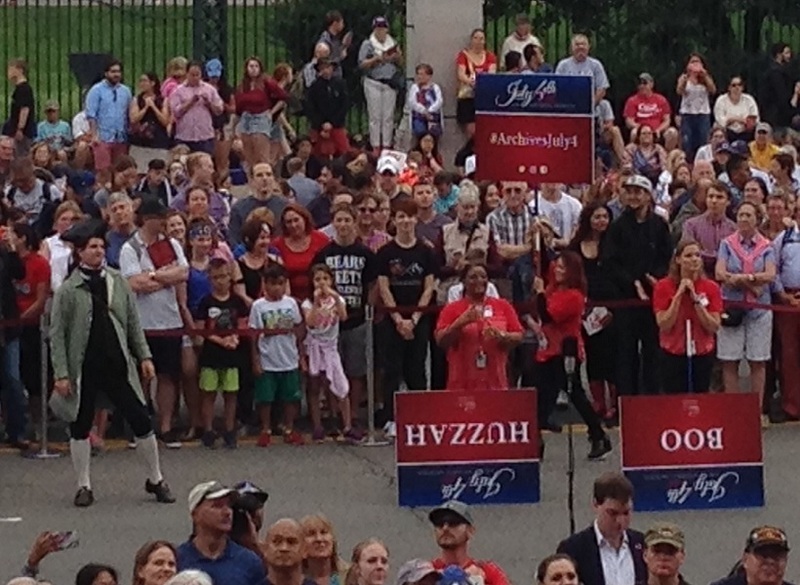 I went, instead, to watch DC’s 4th of July parade: high school bands, wobbly floats, and local beauty queens. What’s not to love? So I’ve come to the end of this post, and of all postings for a while. I’m in the process of selling my house and moving to Arizona. It’s not what I would have chosen — DC is the home of my heart — but I have a 90-year-old father in Tucson. He’s doing great but I’ll still feel better when I’m living closer to him. Everything that isn’t move related will be on a back burner for now. I’ll try to keep up with the History Tourist Facebook and twitter accounts, and hope to be back to blogging in the fall, when I’m settled in Tucson. Meanwhile, I hope you have a fun, safe and history-filled summer. Gallery | This entry was posted in Washington DC and tagged 4th of July in DC, Declaration of Independence, Ned Hector, US National Archives. Bookmark the permalink. Always enjoy your posts so very much and will will look forward to your return to the “blogosphere.” Best of luck to you in your move and best wishes for both you and your dad. I’ve walked this same path. Thank you! It’s a hard decision but the right one, I think. So sorry to hear about your move, but I know that family is important. Good luck on the packing and safe travels, and I look forward to reading more in the Fall. Thank you. I’m hoping to use some of the info on your blog by squeezing a trip to NYC before I leave the east coast, but we’ll see. I enjoyed your “take” on the Archives event. Wishing you the best on your journey west; your readers will miss the humor, insight, and historical analysis of your entries. Looking forward to hearing about the new “chapter” in your life. Thank you. I see a lot of national parks and the wild west in the blog’s future. I always find it strange that while you celebrate independence we in UK celebrate 1066 and the Battle of Hastings when we lost ours to the Normans! Hmm. What does that say about the British (and American) psyche? In future we might celebrate 23rd June as our Independence Day – the day we voted to leave the EU! But will it actually happen? The news in the States is that the vote isn’t binding and that British government seems to be back-pedaling. It is an interesting debate. Everyone is resigning. Some say the referendum is binding others that it is advisory. It has certainly created some divisions in our country that’s for sure. My guess is that Parliament would not dare to overrule the result as this would be seen as undemocratic and against the will of the majority however slender the margin. One of the big issues in the debate was about democratic control. Basically it was a huge political misjudgement by our Prime Minister. Even Barak Obama couldn’t persuade us to stay in We shall see – it isn’t the end of the World! Thank you. I’m going to miss DC and the east coast, but duty calls. the Archives event is definitely worth a road trip down I-95. What a fabulous event! Looks like it was huge fun. I have Hamilton playing in my head all the time too, now. It was great. I’m sorry I didn’t do it sooner but I thought it would be a horrible crush. It wasn’t. Glad you hooked up with Hamilton. I am obsessed. Best wishes. I hope everything is going well for you. Thank you! Everything is going swimmingly and I hope to start blogging again within the month.